Qualitative Text Analysis. A Guide to Methods, Practice and Using Software. Udo Kuckartz. Sage Publications, London. 2014. How can you analyse narratives, interviews, field notes, or focus group data? 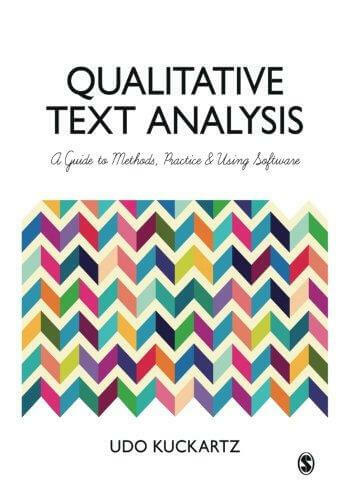 Qualitative text analysis is ideal for these types of data and this textbook provides a hands-on introduction to the method and its theoretical underpinnings. It offers step-by-step instructions for implementing the three principal types of qualitative text analysis: thematic, evaluative, and type-building. Special attention is paid to how to present your results and use qualitative data analysis software packages, which are highly recommended for use in combination with qualitative text analysis since they allow for fast, reliable, and more accurate analysis. The book shows in detail how to use software, from transcribing the verbal data to presenting and visualizing the results. Analyzing Qualitative Data – But How? Nicholas H. Woolf, Christina Silver. Routledge. 2018. 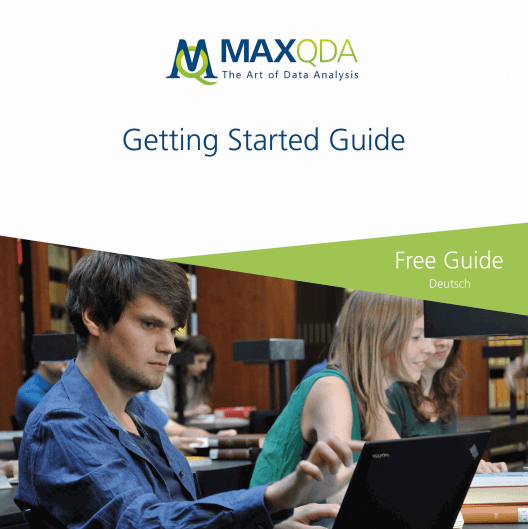 This book provides both an in-depth description of how MAXQDA works and comprehensive instruction in the five steps of the Five-Level QDA method. These steps are illustrated with examples from a variety of research projects. It also contains real-world qualitative research projects to illustrate the use of MAXQDA within the Five-Level QDA method. The book is accompanied by three sets of video demonstrations on the companion website. The following is an alphabetical list of publications that MAXQDA users have submitted. It gives you an idea of the wide range of disciplines the software is used in and the many methodological approaches that it can support. Many of the authors have given permission for us to include contact information for them in case other users want to communicate with them about their research and how they used MAXQDA. Feel free to be in touch with them. If you‘ve published your MAXQDA-supported work and would like to be included in the list, please contact us at info@maxqda.com. We‘ll be happy to share your work with the MAXQDA community. Adelhardt T. / Heckel M. / Stiel S. / Ostgathe C. / Schöffski O.: MRE-Kolonisation oder -Infektion in der Versorgung von Menschen am Lebensende (End-of-Life-Care): Handlungsanweisungen und Informationsmaterialien in zwei deutschen Krankenhäusern—Eine Dokumentenanalyse. Zeitschrift für Palliativmedizin 17: 30–37, 2016. Aguilar B. L. C. / Navarro, R. E.: The Combined Learning in Higher Education. An Experience Through the PBL. In: International Journal of New Technology and Research (IJNTR) ISSN: 2454-4116, 4(2) (pp.12-21), 2018. Ahn, H. / Höfer, Y. / Kunz, L.: Die Ermittlung von Lehrkonzeptionsprofilen zur Unterstützung von Berufungsverfahren. In: Zeitschrift für Hochschulentwicklung 6(3), S. 135-152, 2011. Alejandria-Gonzalez, M.C. / Ghosh, S. / Sacco, N.: Aging in the Global South: Challenges and Opportunities. MD, Lexington Books, 2018. Allemann, L.: Die Samen der Kola-Halbinsel: Über das Leben einer ethnischen Minderheit in der Sowjetunion. Frankfurt am Main [u.a. ]: Lang. Reihe: Menschen und Strukturen. Historisch-sozialwissenschaftliche Studien, Vol. 18, ed. by Heiko Haumann, 2010. Alves, E. J. / Cavalcanti, W. M.: Interveniências Sobre a Temática Físico-Cibernética em Tempos de Indústria 4.0. In: Anais do VI Simpósio de Engenharia de Produção – SIMEP 2018. Salvador, Brasil, 2018. Alves, E. J. / Gonçalves, C. A.: Project Portfolio Prioritization Framework-Case Study Applied at a Brazilian Semiconductor Subsidiary. In: Iberoamerican Journal of Project Management 9(1) (pp.55–77), 2018. Alves, E. J. / Gonçalves, C. A.: Qualitative Comparative Analysis as Research Method in Business Administration: A Systematic Literature Review. In: Métodos e Pesquisa Em Administração 2(2) (pp.4–18), 2017. Alves, E. J. / Gonçalves, C. A. / Bax, M.: Agile Methods from the Viewpoint of Information. In: Informação & Informação 22(3) (p.178), 2017. Alves, E. J.: Inovação em organizações produtoras de software. Saarbrücken: Novas Edições Acadêmicas, 2015. Alves, E. J./ Gonçalves, C. A. / Martins, H. C.: Eficiência em inovação de organizações associadas à fundação mineira de software. In: Revista de Administração e Inovação 11(2) (pp.220–240), 2014. Alves, E. J. / Lopes, A. L. M.: Eficiência Relativa de Organizações de Tecnologia da Informação em Minas Gerais: Considerações Acerca da Gestão da Inovação e Indicadores Financeiros. In: XXXV EnANPAD (pp. 1–12), Rio de Janeiro, 2011. Baums-Stammberger, B. / Hafeneger, B. / Morgenstern-Einenkel, A.: „Uns wurde die Würde genommen“. Gewalt in den Heimen der evangelischen Brüdergemeinde Korntal in den 1950er bis 1980er Jahren – Aufklärungsbericht, Korntal/Stuttgart, 2018. 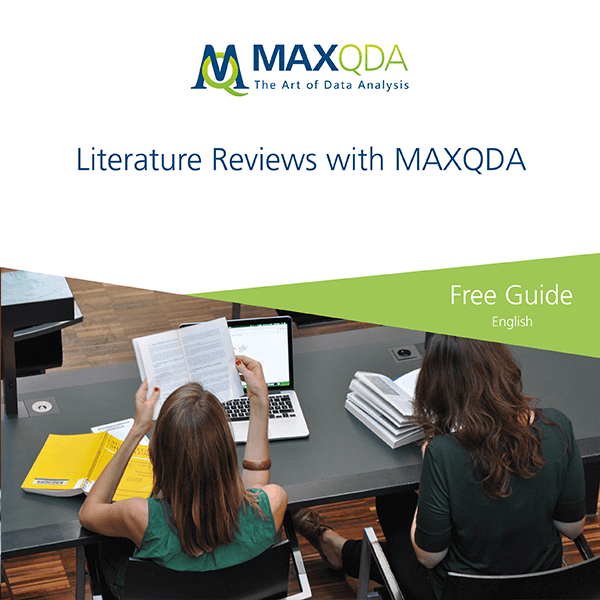 Beheshti, S.: Qualitative Data Analysis With MAXQDA. In: Ravesh shenasan. Tehran, 2016. Beniston, M. / Stoffel, M. / Hill, M.: Impacts of climatic change on water and natural hazards in the Alps: Can current water governance cope with future challenges? Examples from the European “ACQWA” project. In: Environmental Science and Policy. In Press, 2010. Berendt J. / Oechsle K. / Thomas M. / et al. : Integration der Palliativmedizin in die von der Deutschen Krebshilfe e.V. geförderten onkologischen Spitzenzentren. In: Deutsche Medizinische Wochenschrift 141(2) (pp.e16–23), 2016. Beusterien, K. / Tsay, S / Gholizadeh S. / Su, Y.: Real-world experience with colorectal cancer chemotherapies: patient web forum analysis. In: Ecancermedicalscience 7 (pp.361-371), 2013. Bolander, B. / Locher, M.A. : Doing sociolinguistic research on computer-mediated data: A review of four methodological issues. In: Discourse, Context & Media 3 (pp.14-26), 2014. Booth C.L. : Experiences and wisdom behind the numbers: qualitative analysis of the National Action Alliance for Suicide Prevention’s Research Prioritization Task Force stakeholder survey. In: American Journal of Preventive Medicine 47(3S2) (pp.106-114), 2014. Branney, J. / Priego-Hernández, J.: A mixed methods evaluation of team-based learning for applied pathophysiology in undergraduate nursing education. In: Nurse Education Today, 2017. Cansız, M. / Kurnaz, Z. / Yavan, N.: Girişimcilik ekosisteminde Türkiye için yeni bir araç: yenilik merkezleri/ağları. In: Verimlilik Dergisi (4) (pp.7-69), 2018. Carpenter , D.M. / Geryk, L.L. / Sage, A. et al. : Exploring the theoretical pathways through which asthma app features can promote adolescent self-management. In: Translational Behavioral Medicine (pp 1-10), 2016. Çınarbaş, H. İ.: Experiences of Students with Disabilities in an English Language Teacher Education Program: A Case Study on Preservice Teachers with Visual Impairment. Master’s thesis. Ankara: Middle East Technical University, 2016. Cisneros, C. / Jara, V / Ballesteros, B.: Produciendo datos en Twitter: posibilidades y límites del análisis con software de computación cualitativa. Un ejemplo a partir del caso de “La Manada”. In: Santoveña, S. (coord) Enredados en el mundo digital. Sociedad y redes sociales. Madrid: UNED (pp 87-116), 2018. Colorado, B. / Edel, R.: Usabilidad pedagógica de las TIC: Perspectiva y reflexión desde la práctica educativa. 2014. Coryn, C.L.S. / Schröter, D.C. / McCowen, R.H.: A Mixed Methods Study of Some of the Factors Associated with Successful School Strategies for Native Hawaiian Students in the State of Hawaii. In: Journal of Mixed Methods Research 8(4) (pp.377-395), 2014. D’Andrea, L. M. / Waters, C. / Rudd, R.: Using computer assisted qualitative software (CAQDAS) to evaluate a novel teaching method for introductory statistics. In: International Journal of Technology in Teaching and Learning, 7(1) (pp. 48-60), 2011. De Gregorio, E. / Tagliafico, I. / Verde, A.: A comparison of qualitatively and quantitatively driven analytic procedures of psychotherapeutic group sessions with deviant adolescents. 2017. De Gregorio, E. / Gallon M. / Verde, A.: Troubled groups in situation: qualitative analysis of psychotherapeutic sessions with deviant adolescents. In: Quality & Quantity: International Journal of Methodology (pp. 1-12), 2013. De Lima, L. M.: Analyzing and Mapping Word Frequencies in Interviews using MAXQDA 2018. MAXQDA Research Blog, 2019. De Lima, L. M.: ‘Plants are cooking under the soil’: food production, models of nature and perceptions of climate change among indigenous peasants in Amazonia, Brazil. In: Bennardo, G. (Ed.). Primary Food Producers and Climate Change. New York: Routledge, 2019. Dittrich, E. / Schrader, H. (Eds. ): “When Salary is not Enough…” Private Households in Central Asia, Wien, 2015. Dittz, E. S. / Alves, C. R. L. / Duarte, E. D. / Magalhães, L. C.: Contribution of the Newborn Behavioral Observations (NBO) for the maternal care of preterm neonates. In: Journal of Human Growth and Development 27(3) (pp.262-271), 2017. Dresing, T. / Pehl, T.: Transkription. In: Mey, G. / Mruck, K. (Hg. ): Handbuch Qualitative Forschung in der Psychologie. VS Verlag, 2010. Duineveld L. AM / Wieldraaijer T. / Wind J. et al. : Primary care-led survivorship care for patients with colon cancer and the use of eHealth: a qualitative study on perspectives of general practitioners. In: BMJ Open (pp.1-10), 2016. Feld, T.C. / Lauber-Pohle, S. (Hrsg. ): Organisation und Profession. Felder erwachsenenpädagogischer Forschung. Wiesbaden: Springer VS, 2018. Fleming, P. J. / Andes K. L. / DiClemente, R. J.: ‘But I’m not like that’: young men’s navigation of normative masculinities in a marginalised urban community. In: Culture, Health & Sexuality – An International Journal for Research, Intervention and Care, Paraguay 2013. DOI:10.1080/13691058.2013.779027. Contact Paul Fleming (pjflemin@live.unc.edu) or Karen Andes (kandes@emory.edu). Fournis, Y. / Dumarcher, A.: Le territoire du CRDT. La construction d’un espace intellectuel, entre science et territoire. Rimouski (QC): Éditions GRIDEQ-CRDT, 2017. Fuerst, S.: Entrepreneurial internationalization: A process perspective. Doctoral dissertation, University of Turku, 2017. Galán-Díaz, C. / Edwards, P. / Nelson, J. D.: Digital innovation through partnership between nature conservation organisations and academia: A qualitative impact assessment. In: Ambio 44(4) (pp. 538-549), 2015. Gasteiger, L. / Schneider, W.: Die Modernisierung der Hochschule im Spannungsfeld von politischer Steuerung und Autonomie. Interpretativ-rekonstruktive Diskursforschung und Grounded Theory Methodologie. In: Angermuller, J. / Nonhoff, M. / Herschinger, E. , et al. (Hg. ): Diskursforschung. Ein interdisziplinäres Handbuch, 2 Bde., (pp.140-164). Transcript, Bielefeld, 2014. Gata, Ma.L.L.P. : Abeyance Structures for an Environmental Social Movement: The Case of the US Bases Cleanup Campaign in the Philippines. In: Asia Life Sciences: The Asian International Journal of Life Sciences, 25(2) (pp.649-661), 2016. Gata, Ma.L.L.P. : Environmental Inequalities among Indigenous People in the Philippines: The Case of the Tagbanua in Tara Islands, Philippines. In: Journal of Environment and Development, 5(1) (pp.31-38), 2014. Gata, Ma.L.L.P. : A Filipino Transnational Advocacy Network: A Case Study of the US Bases Clean-Up campaign in the Philippines and the United States of America. Ph.D. Dissertation. Department of Sociology and Criminology & Law, University of Florida, 2011. Gizzi, M. C.: 11_28 Four Stages-Poster-CTLT-GizziFINAL-ilovepdf-compressed>Harnessing the power of MAXQDA for conducting social science research. Illinois State University, 2019. Gubrium, A. C. / Krause, E.L.: “Doing Your Life”: Narrative Intervention with Young Mothers as Storytellers. In: Human Organization 77(3) (pp.214-227), 2018. Gugushvili, T. / Salukvadze, G.: Formation of tourism services through Georgian culture: Example of Kazbegi Municipality. In: Journal of Tourism Theory and Research, 1 (1) (pp. 68-77), 2015. Guetterman, T. / Creswell, J. W. / & Kuckartz, U.: Using joint displays and MAXQDA software to represent the results of mixed methods research. In: McCrudden, M. / Schraw, G. / Buckendahl, C. (Eds. ), Use of visual displays in research and testing: Coding, interpreting, and reporting data (pp. 145-176). Charlotte, NC: Information Age Publishing, 2015. Hatani, F.: Analyzing High-Profile Panel Discussion on Global Health: An Exploration with MAXQDA. In: Forum Qualitative Social Research 16(1) Art. 14, 2015. Heckel, M. / Herbst, F.A. / Adelhart, T. / Tiedtke, J.M. / Sturm, A. / Stiel, S. / Ostgathe, C.: Understanding institutional stakeholders’ perspectives on multidrug-resistant bacterial organism at the end of life: a qualitative study. In: Clinical Interventions in Aging 12 (pp.1605–1613), 2017. Heckel, M. / Sturm, A. / Herbst, F.A. / Ostgathe, C. / Stiel, S.: Effects of Methicillin-Resistant Staphylococcus aureus/Multiresistant Gram-Negative Bacteria Colonization or Infection and Isolation Measures in End of Life on Family Caregivers: Results of a Qualitative Study. Journal of Palliative Medicine 20(3) (pp.273–281), 2017. Heckel, M. / Rester, D. / Seeberger, B.: „Und den Geschmack habe ich heute auch noch auf der Zunge.“ Geruch und Geschmack im Lebensverlauf—Ein qualitatives Experiment. Forum Qualitative Sozialforschung/Forum: Qualitative Social Research 13(3) Art. 3, 2017. Hejnal, O. / L’ubomir L.: Úvod Do MAXQDA: Kvalitativní, Kvantitativní a Smíšený Výzkumný Design. In: Kapitoly z kvalitativního výzkumu, ed. by L. Toušek. Plzeň: Západočeská univerzita v Plzni (pp. 105-118), 2015. Hemme, R.: Metakognitionsanthropologie. Kulturelle Modelle von „Wissen“ und „Lernen“ im Psychologiestudium. In: Berliner Beiträge zur Ethnologie Bd. 43, Weißensee Verlag, Berlin, 2018. Herbst, F.A. / Stiel, S. / Heckel, M. / Ostgathe, C.: Beschreibung und Analyse der Partner in Netzwerken der Hospiz- und Palliativversorgung in Bayern an der Schnittstelle ambulant-stationär: Eine Mixed-Methods-Studie. In: Zeitschrift für Palliativmedizin 18(06) (pp. 310–318), 2017. Herbst, F.A. / Heckel, M. / Stiel, S. / Ostgathe, C.: Kompetent vernetzt – optimal versorgt! Förderliche Faktoren der Zusammenarbeit in hospizlich-palliativen Versorgungsnetzwerken in Bayern. In: Bundesgesundheitsblatt – Gesundheitsforschung – Gesundheitsschutz 60(1) (pp.37–44), 2017. Hille, S. / Bakker P.: Engaging the Social News User: Comments on news sites and Facebook. In: Journalism Practice 8(5) (pp.563-572), 2014. Horwath, I.: „Gut Wehr!“ und die HeldInnen von Heute: Empirische Analysen zur Gleichstellung im Feuerwehrwesen. Dissertation, eingereicht an der Sozial- und Wirtschaftswissenschaftlichen Fakultät der JKU Linz im November 2010. Hussain, A.: Transport Infrastructure and Social Inclusion: A Case Study of Tourism in the Region of Gilgit-Baltistan. Faculty of Environment, Society and Design, Lincoln University, New Zealand, 2017. Hussain, A.:Transport infrastructural development and livelihood: A case of adaptation and diversification strategies in the face of tourism. In: Lee, Craig (Editor); Filep, Sebastian (Editor); Albrecht, Julia N (Editor); Coetzee, Willem JL (Editor). CAUTHE 2017: Time For Big Ideas? Re-thinking The Field For Tomorrow. Dunedin, New Zealand: Department of Tourism, University of Otago, 2017: 93-104. Jouhari, Z. / Haghani, F. / Changiz, T.: Factors affecting self-regulated learning in medical students: a qualitative study. In: Medical Education Online Vol 20, 2015. Jovanović, O. / Pavlović, M.: Is It Always Us or Them: How Do Young Serbs and Bosniaks Perceive Intergroup Borders? In: Pratto F. / Žeželj I. / Maloku E. / Turjačanin V. / Branković M. (Eds. ), Shaping Social Identities After Violent Conflict (pp. 89-112). London: Palgrave Macmillan, 2017. Jovanović, O. / Plazinić, Lj. / Joksimović, J. / Komlenac, J. / Pešikan, A.: Developing the Early Warning System for identification of students at risk of dropping out using a collaborative action research process. In: Psihološka istraživanja 20(1) (pp.107-125), 2017. Joy, P. / Mann L. / Blotnicky K.: Identification of Healthy Eating and Active Lifestyle Issues through Photo Elicitation. In: Canadian Journal of Dietic Practice and Research 75(3) (pp.152-156), 2014. Kovač Cerović, T. / Jovanović, O. / Pavlović Babić D.: Individual education plan as an agent of inclusiveness of the educational system in Serbia: different perspectives, achievements and new dilemmas. In: Psihologija 49 (pp.431-445), 2016. Krause, E.L.: Tight Knit: Global Families and the Social Life of Fast Fashion. Chicago: University of Chicago Press, 2018. Krause, E.L. / Bressan, M.: Circulating Children, Underwriting Capitalism: Chinese Global Households and Italian Fast-Fashion. In: Current Anthropology 59(5) (pp.572–595), 2018. Krause, E.L. / Bressan, M.: Via Gramsci: Hegemony and Wars of Position in the Streets of Prato. International Gramsci Journal 2(3) (pp.31–66). Special issue on Gramsci and Anthropology: A “Round Trip.”, 2017. Krenz, S. / Walter, U.: Eine gesundheitsfördernde Schule für alle – Chancengleichheit und Teilhabe von Grundschulkindern mit Behinderung – eine qualitative Analyse über Herausforderungen und Umsetzungsmöglichkeiten. In: Das Gesundheitswesen 8 (9), 2010. Kuckartz, U.: Qualitative Text Analysis. A Guide to Methods, Practice and Using Software. Sage Publications Ltd., 2014. Kuckartz, A. / Sharp, M.J.: Responsibility: A Key Category for Understanding the Discourse on the Financial Crisis—Analyzing the KWALON Data Set with MAXQDA 10. Forum Qualitative Sozialforschung / Forum: Qualitative Social Research 12(1) Art.22, 2011. Lauber-Pohle, S.: Raumkooperation zwischen Hochschule und externen Partnern – eine arbeitsteilige Funktionalisierung. In: Seitter, W. / Feld, T.C. (Hrsg. ): Räume in der wissenschaftlichen Weiterbildung. Wiesbaden: Springer VS(i.V), 2018. Lauber-Pohle, S.: Inklusion an Hochschulen – durch Vernetzung!? In: Weber, S. /Schröder, C. (Hrsg. ): Organisation und Netzwerke. Wiesbaden: Springer VS (pp. 311-321), 2018. Lauber-Pohle, S.: Soziale Netzwerkbildung und Online-Lernen – Reflektionen zur Arbeit mit sozialen Netzwerken als Aufgabe erwachsenenpädagogischen Handelns In: Feld, T.C./ Lauber-Pohle, S. (Hrsg. ): Organisation und Profession. Felder erwachsenenpädagogischer Forschung. Wiesbaden: Springer VS (pp. 307-323), 2018. Lauber-Pohle, S: Soziales Netzwerkbildung und Online-Lernen. Wiesbaden Springer VS, 2018. Lauber-Pohle, S. / Ruhlandt, M.: Inklusives Studieren bei Blindheit und Sehbeeinträchtigung – Übergänge zwischen Institutionalisierung und Nachfrageorientierung. In: Welti, F. /Herfert A. (Hrsg. ): Übergänge im Lebenslauf von Menschen mit Behinderungen. Hochschulzugang und Berufszugang mit Behinderung. Kassel: University Press (pp. 108 – 123), 2017. Lewins, A. / Silver, C.: Using Software in Qualitative Research, A Step-by-Step Guide. Second Edition. Sage Publications, London, 2014. Loxton, M.: Integrating Lessons Learned Processes for Improved Clinical Outcomes. An article excerpt about how to increase project team effectiveness. In: Whitney, Bradley, & Brown Inc., 2014. Martínez, D.M. : Aprender etnografía investigando el franquismo. El caso del “Seminario de Antropología Social. Teoría y práctica de la Investigación”. In: Revista Murciana de Antropología, 23 (pp.225-240), 2016. Matthysl, M.: Cultural Capital, Identity, and Social Mobility: The Life Course of Working-Class University Graduates. Routledge Advances in Sociology, Taylor & Francis, 2012. Mitchell, M. B. / Kuczynski, L.: Does anyone know what is going on? Examining children s lived experience of the transition into foster care. In: Children and Youth Services Review 32 (pp. 437-444), 2010. Montazeri, S. / Gharacheh, M. / Mohammadi, N. et al. : Determinants of Early Marriage from Married Girls’ Perspectives in Iranian Setting: A Qualitative Study. In: Journal of Environmental and Public Health Volume 2016 (pp. 1-8), 2016. Mössner, S.: Integrierte Stadtentwicklungsprogramme – eine Vertrauens-Konstellation . Beispiele aus Frankfurt a.M. und Mailand. Dissertation, Kiel 2010. Oliveira, L.: O trabalho em “tempos de crise”: enquadramentos da mídia sobre a Reforma Trabalhista no Brasil. In: Pesquisadora do Grupo “Comunicação Política, Partidos e Eleições” (CPPE), 2018. Paulus, T. / Lester, J. / Dempster, P.: Digital Tools for Qualitative Research. Sage, Los Angeles, 2014. Peace, R. / Hoven, B.: Computers, Qualitative Data and Geographic Research. In: Hay, I. (ed): Qualitative Research Methods in Human Geography. 3rd fully revised edition. Oxford University Press (pp. 295-313), Oxford, 2010. Peng, H.: A study of L2 EAP learners’ performance in a simulated international conference: Three markers of interpersonal relationship in discussion sessions. In: The Asian Journal of Applied Linguistics 5(1) (pp. 130-141), 2018. Pestinger, M. / Stiel, S. / Elsner, F. et al. : The Desire to Hasten Death: Using Grounded Theory for a Better Understanding “When Perception of Time Tends to Be a Slippery Slope”. In: Palliative Medicine 29(8) (pp.711–9), 2015. Quinn, A. / Saini, M.: Touchstones of Hope: Participatory Action Research to Explore Experiences of First Nation Communities in Northern Britisch Colobia. Evaluation Report. Factor-Inwentash Faculty of Social Work, University of Toronto, Toronto, 2012. 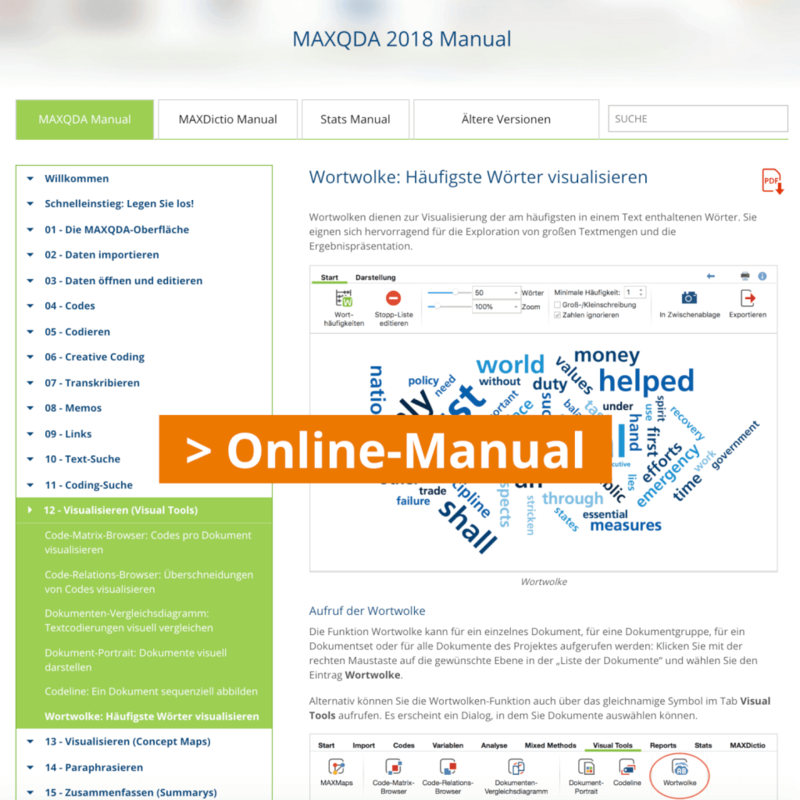 Rädiker, S. / Kuckartz, U.: Analyse qualitativer Daten mit MAXQDA: Text, Audio und Video. 1. Auflage, Springer VS, Wiesbaden, 2019. Rädiker, S.: Evaluation von Weiterbildungsprozessen. Status quo, Herausforderungen, Kompetenzanforderungen. 1. Auflage, Tectum Verlag, 2013. Rutherford / Forde, E. / Priego-Hernandez, J. / Butcher, A. / Wedderburn, C.: Using photography to enhance GP Trainees’ reflective practice and professional development. Medical Humanities, 44 (pp. 158-164), 2018. Rwehumbiza, D. A. / Marinov, M. A.: Intra-regional diversification and revenue of export manufacturers. In: European Journal of International Management, forthcoming. 2019. Rwehumbiza, D. / Dornberger, U. / Nabi, M. N. U.: International expansion of clothing manufacturers from Kenya: A dichotomy between firms’ capabilities and institutional support. In: Marinov, M. A. and Sorensen, O.J. (Eds. ), Finding Solutions to the Challenges of Internationalisation, Aalborg University Press, 2016. Rwehumbiza, D.: Internationalisation differentials of clothing manufacturers from East Africa: Drivers beyond trade preferences. Unpublished PhD Dissertation, International Small Enterprises Promotion and Training (SEPT) Program, Leipzig University, Germany, 2015. Sánchez, S.C.: La memoria en el cuerpo. La situación socio-sanitaria en el Levante español de la posguerra. In: Revista Murciana de Antropología 23 (pp.47-64), 2016. Sánchez, S.C. / Becerra, J.I.R. : Ser profesional sanitario en el siglo XXI: algunos apuntes. In: Cultura de los cuidados 49 (pp.119-130), 2017. Sánchez, S.C. / Cano, C.M. : Cuidados y diversidad cultural: un estudio de caso en un centro de atención primaria en Murcia. In: Cultura de los Cuidados 50 (pp.127-140), 2018. Sánchez Amboage, E.: La promoción de destinos turísticos termales a través de los medios sociales: análisis del caso de los balnearios de Galicia y del norte de Portugal. Universidade da Coruña. Departamento de Socioloxía e Ciencia Política da Administración, 2015. Santha, K.: A TRIANGULÁCIÓ-TIPOLÓGIÁK ÉS A MAXQDA KAPCSOLATA A KVALITATÍV VIZSGÁLATBAN. In: VEZETÉSTUDOMÁNY / BUDAPEST MANAGEMENT REVIEW Nr. 12 (pp. 33-40), 2017. Sarosa, S.: Failure in Accounting Information Systems Development and Adoption within Indonesian SMEs through Actor Network Theory Lens. In: The Proceedings of The 2nd Parahyangan International Accounting Business Conference, 2010. Schriewer, K. / Diaz Agea, J.L. :Cuestiones prácticas en cuanto a la elaboración de relatos biográficos. In: Cuaderns de Antropología 20 (1) (pp.114-131), 2015. Schwartz, R. M.: Digital Partnership: Combining Text Mining and GIS in a Spatial History of Sea Fishing in the United Kingdom, 1860 to 1900. In: International Journal of Humanities and Arts Computing 9 (1) (pp. 36-56), 2015. SEVİLMİŞ, A. / ERDOĞAN, A. / ŞİRİN, E.F.: Content Analysis of the theses done on service quality in sports 2005 -2017. Presented at the I. International Congress of Physical Education, Sport, Recreation, and Dance, Istanbul, 2018. ŞİRİN, E.F. / SEVİLMİŞ, A.: Content Analysis of the decisions of professional soccer discipline commitee in Turgay Şeren season of Sport TOTO Super League. Presented at the I. International Congress of Physical Education, Sport, Recreation, and Dance, Istanbul, 2018. ŞİRİN, E.F. / SEVİLMİŞ, A.: Analysis of official internet sites of sport clubs in terms of social media communication and marketing communication: A study on Turkish and German sport clubs. Presented at the Internatiınal Congress on Recreation and Sport Management, Muğla, 2018. Smith, D.D. : How do 4th, 5th, and 6th grade students’ categories of cognitive reflections in interviews on derivational morphology compare to their upper level spelling inventory orthographic knowledge? 2012. Squires, D.: Bridging the Learning Gap – Augmented Reality’s Impact on Associative Information Processing, Cognitive Load, & Working Memory: A Mixed-Methods Research Study. In: Journal of Educational Technology 15(1) (pp.17-25), 2018. Stefer, C.: Ansätze zur Triangulation mithilfe qualitativer Forschungssoftware (MAXQDA 11). In: Elsner, D. / Viebrock, B.: Triangulation in der Fremdsprachenforschung. Peter Lang AG, Bern, 2015. Stiel, S. / Heckel, M. / Christensen, B. et al. : In-service Documentation Tools and Statements on Palliative Sedation in Germany—Do They Meet the EAPC Framework Recommendations? A Qualitative Document Analysis. In: Support Care Cancer 24(1) (pp.459–67), 2016. Stiel, S. / Pestinger, M. / Moser, A. et al. : The Use of Grounded Theory in Palliative Care: Methodological Challenges and Strategies. In: Journal of Palliative Medicine 13(8) (pp.997–1003), 2010. Strohbuecker, B. / Eisenmann, Y. / Galushko, M. et al. : Palliative care needs of chronically ill nursing home residents in Germany: focusing on living, not dying. In: International Journal of Palliative Nursing 17 (1) (pp.27-34), 2011. Techmeier, I.: Das Verhältnis von Kriminalität und Ökonomie. Eine empirische Untersuchung am Beispiel der Privatisierung der volkseigenen Betriebe der DDR durch die Treuhandanstalt. Wiesbaden: VS-Verlag, 2012. Techmeier, I.: Die ökonomischen Rahmenbedingungen der Privatisierungen. In: Boers, K. et al. (Hrsg.). Wirtschaftskriminalität und die Privatisierung der DDR-Betriebe (pp.87-148). Baden-Baden: Nomos, 2010. Techmeier, I.: Die Funktionalität von Wirtschaftskriminalität. In: Boers, K. et al. (Hrsg.). Wirtschaftskriminalität und die Privatisierung der DDR-Betriebe (pp.241-325). Baden-Baden: Nomos, 2010. Techmeier, I.: „Verkaufen um jeden Preis.“ Korruption in der Treuhandniederlassung Halle. In: Deutschland Archiv Volume 5 (pp.67-75), 2010. Techmeier, I.: Die Privatisierung der Mathias-Thesen-Werft und der Volkswerft Stralsund an den Bremer Vulkan Verbund. In: Deutschland Archiv. Volume 3 (pp.433-441), 2010. Theis, R.: Sportunterricht aus Schülerperspektive. Eine qualitative Studie über Sichtweisen und Wünsche der Hauptschüler und Gymnasiasten zu ihrem Sportunterricht. Hofmann, Schorndorf, 2010. Vosbergen, S. / Janzen, J. / Stappers, P.J. / van Zwieten, M.C. / Lacroix, J. / Idema, K. / van den Broek, I. / Kemps, H.M. / Kraaijenhagen, R.A. / Peek, N.: A qualitative participatory study to identify experiences of coronary heart disease patients to support the development of online self-management services. In: International Journal of Medical Informatics 82 (12) (pp.1183-1194), 2013. Walter, U. / Edvardsson, B. / Öström, Å.: Drivers of customers’ service experiences, a study in the restaurant industry. In: Managing Service Quality 20 (pp. 236-258), 2010. 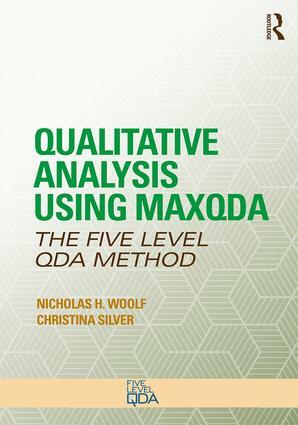 Woolf, N. / Silver, C.: Qualitative Analysis Using MAXQDA. The Five Level QDA Method. Routledge. 2018. Zech, R. / Dehn C. / Schunter, J. et al. : Organisationen in der Weiterbildung: Selbstbeschreibungen und Fremdbeschreibungen. VS Verlag, Wiesbaden, 2010. Angermeyer, M.C. / Schulze, B. / Dietrich, S.: Courtesy Stigma – A Focus Group Study of Relatives of Schizophrenia Patients. In: Social Psychiatry and Psychiatric Epidemiology 38 (pp.593-602), 2003. Arnold, M. / Behrens, T. / Siebenhüner, B.: Qualitative Sozialforschung im GELENA-Projekt. In: Kuckartz, U. (Hrsg. ): Tagungsband zur CAQD 2005 (S.29-42), Marburg 2005. Baker, L. / Lavender, T. / Tincello, D.: Factors that influence women’s decisions about whether to participate in research: An exploratory study. In: Birth 32 (1) (pp.60-66), 2005. Baker, M.C. / McFarland, D.A. / Gonzales, M. et al. : The impact of integrating the elimination programme for lymphatic filariasis into primary health care in the Dominican Republic. In: International Journal of Health planning and Management 22 (4), 2007. Bergs-Winkels, D. / Classen, G.: “Hauptsache, ich kriege überhaupt eine Arbeit“ – Qualitative Interviews zu Arbeitseinstellungen bei Jugendlichen. In: Merkens, H. / Wessel, A. (Hrsg. ): Zwischen Anpassung und Widerstand. Band 8 der Reihe „Jugendforschung aktuell“, Baltmanns-Weiler (pp.183-192), 2003. Beschorner, T. / Behrens, T. / Hoffmann, E. / et al. : Institutionalisierung von Nachhaltigkeit. Eine vergleichende Untersuchung der organisationalen Bedürfnisfelder Bauen & Wohnen, Mobilität und Information & Kommunikation. Metropolis Verlag, Marburg, 2005. Beune, E.J. / Haafkens, J.A. / Meeuwesen, L.: “Hee broedoe” (hoog bloed): Opvattingen over hypertensie van Creools-Surinaamse patiënten in de huisartsenpraktijk. In: Huisarts en Wetenschap, 47 (13),(pp.620-624), 2004. Beune, E.J. / Haafkens, J.A. / Schuster, J.S. et al. : “Under pressure”: How Ghanaian, African-Surinamese and Dutch patients explain hypertension. In: Journal of Human Hypertension 20 (12) (pp. 946-55), 2006. Bock, S.: Schriftsprachliche und mathematische Kompetenzen, Erfahrungen und Interessen des 10jährigen “Rachet” im Kontext seiner persönlichen Entwicklung und sozialen Lebenswelt. Fallstudie im im Rahmen des Projekts LISA&KO. Diplomarbeit, 2005. Boehnke, M. : Gut gebildet = kinderlos? Zu feinen deutsch-deutschen Unterschieden im Umgang mit dem Kinderwunsch. In: BIOS – Zeitschrift für Biographieforschung, Oral History und Lebensverlaufsanalysen, 22(1) (pp.12-31),Budrich Verlag, Leverkusen, 2009. Boers, K.: Wirtschaftskriminologie – Vom Versuch, mit einem blinden Fleck umzugehen. In: Monatsschrift für Kriminologie und Strafrechtsreform 84 (S.335-356), 2001. Boers, K. / Nelles, U. / Nippert. A.: Limited knowledge, unmarked spaces and increased opportunities after the reunification. Economic crime in Germany. In: Pounsaers, P. / Ruggiero, V. (eds. ): La criminalite economique et financiere en Europe. Economic and financial crime in Europe. L’Harmattan, Paris, (p.99-121), 2002. Boers, K. / Theile, H. / Karliczek, K.-M.: Wirtschaft und Strafrecht – Wer reguliert wen? In: Oberwittler, D. / Karstedt, S. (Hrsg. ): Soziologie der Kriminalität. Kölner Zeitschrift für Soziologie und Sozialpsychologie, Sonderheft 43/2003 (pp.469-493). VS Verlag für Sozialwissenschaften, Wiesbaden, 2004. Cent J. / Kobierska H. / Grodziska-Jurczak, M. / Bell S.: Who is responsible for Natura 2000 in Poland? – A potential role of NGOs in establishing the programme. In: International Journal of Environment and Sustainable Development 6 (4) (pp. 422-435), 2007. De Haan, G. / Kuckartz, U. / Rheingans-Heintze, A.: Bürgerbeteiligung in Lokale Agenda 21-Initiativen. Analysen zu Kommunkaitons- und Organisationsformen. Herausgegeben vom Umweltbundesamt. Opladen, Leske + Budrich, 2000. De Koster, K. / Loots, G.: Samen op weg naar een betere hulpverlening: kwalitatieve analyse van de beleving van het implementatieproces van Integrale Jeugdhulpverlening in de pilootregio Gent-Meetjesland, Brussel, V.U.B., Faculteit Psychologie en Educatiewetenschappen, 2004. De Souza, C.R.B. : On the Relationship between Software Dependencies and Coordination: Field Studies and Tool Support. Ph.D. dissertation, Donald Bren School of Information and Computer Sciences, University of California, 2005. Del Cairo, C. / Delgado, M. / Bedoya, L.M. et al. : Practicas hogareñas del cuidado del recién nacido y la embarazada en la región pacífica caucana. Colombia, Antípoda, Bogotá, 2006. Dittman, B.: Sensation im Sommerloch? Wie berichten die Print-Medien über die TV-Duelle der Kanzlerkandidaten? Abschlußarbeit, 2003. Dimbath, O.: Alles aus Spaß an der Freud. In: Neue Praxis 53 (4) (S.389-403), 2005. Dimbath, O.: Berufswahl zwischen Rationalität und Intuition. Vortrag an der 33. Konferenz der DGS, Kassel, 2006. Dimbath, O.: Spaß als Paravent. In: Göttlich, U. / Müller, R. / Rhein, S. et al (Hrsg. ): Arbeit Vergnügen und Politik in Jugendkulturen, Juventa, 2007. Dolan, E.M. / Braun, B. / Katras, M.J. et al. : Rural TANF recipients: How they fare over time. Presented at the Welfare Research and Evaluation Conference, Crystal City, Virginia, June 5, 2006. Dolan, E.M. / Seiling, S. / Glesner, T.J.: Making it work: Rural low-income women in service jobs. In: Cude, B.J. (ed. ): Proceedings of the 33rd Conference for the Eastern Family Economics and Resource Management Association (pp. 38-46), Knoxville, TN., 2006. Eraso, J. / Bravo, Y. / Delgado, M.: Creencias, actitudes y prácticas sobre crianza en madres cabeza de familia en Popayán: un estudio cualitativo. In: Revista de Pediatria 41(3) (pp. 23-40), 2006. Ernst, S.: Manual Lehrevaluation, VS Verlag, Wiesbaden, 2008. Faulstich-Wieland, H. / Weber, M. / Willems, K.: Doing Gender im heutigen Schulalltag. Empirische Studien zur sozialen Konstruktion von Geschlecht in schulischen Interaktionen. Jurenta, Weinheim, 2. Auflage, 2004. Feuerstein, Th.J. : Computerunterstützte Netzwerkanalyse (CANA) und Netzwerkförderung. Ein flexibles Verfahren für die Ausbildung und Praxis Sozialer Arbeit. In: Miethe, I., u.a. (Hrsg.) : Rekonstruktion und Intervention. Reihe Rekonstruktive Forschung in der Sozialen Arbeit, Opladen 2007. Flanschger, J.: Die Bedeutung des Raumes für den Unterricht. Diplomarbeit an der Universität Graz, 2005. Fleischmann, I.: Stressmanagement und Burnout-Prävention in der forensischen Psychiatrie: Belastungen und Coping in der Arbeit mit männlichen Klienten des deutschschweizerischen Massnahmenvollzuges. Lizenziatsarbeit an der Psychiatrischen Universitätsklinik Zürich in der Klinik für Sozial Psychiatrie und Allgemeinpsychiatrie Zürich West, in der Forschungsgruppe Public Mental Health, Universität Zürich, 2007. Fringer, A.: Beratungsbesuche nach § 37 Abs. 3 SGB XI – Empirische Evaluation eines Beratungsstandards aus dem Kreis Soest. MScN, 2006. Gask L. / Lever-Green G. / Hayes, R. : Dissemination and implementation of suicide prevention training in one Scottish region, BMC Health Services Research (pp.8-246), 2008. Glesner, T. J.: Grief and separation: Rural low income mothers’ experiences with foster care. Unpublished Master’s Thesis, University of New Hampshire, 2006. Griebel,W. / Niesel, R.: Abschied vom Kindergarten – start in die Schule. Verlag Don Bosco, 2002. Grunenberg, H.: Die Qualität qualitativer Forschung. Eine Metaanalyse erziehungs- und sozialwissenschaftlicher Forschungsarbeiten.Diplomarbeit am Fachbereich Erziehungswissenschaften der Philipps-Universität Marburg, 2001. Hellmann, W.: Schulverweigerer in außerschulischen Lernstandorten. Eine Evaluations- und Nutzerstudie. In: Smit U. (ed): Emprirical Perspectives on CLIL Calssroom Discourse. Verlag Peter Lang, Frankfurt, 2007. Hess-Wiktor, K.: What does it mean to be a hospice volunteer in Poland? In: European Journal of Palliative Care 16(5) (pp. 249-251), 2009. Hofer, K . / Wolfensberger, B.: Fächerübergreifender Unterricht am Gymnasium am Beispiel eines sozio-ökologischen Unterrichtsprojektes zu den neuen Biotechnologien. In: Zeyer, A. / Wyss, M. (Hrsg. ): Interdisziplinarität im Unterricht auf der Sekundarstufe II. Berichte aus Praxis und Forschung Band 3 (pp.86-114). Verlag Pestalozzianum, Zürich 2006. Hofer, K. / Piniel, J. / Wolfensberger, B.: Die Moderation von Klassengesprächen im Schnittbereich von Naturwissenschaft und Gesellschaft. In: Akten des Vierten Forum Fachdidaktiken Naturwissenschaften, Locarno, 2006. Hoops, S. / Permien H.: Evaluation des Pilotprojekts Ambulante Intensive Begleitung (AIB), Verlag Deutsches Jugendinstitut, München, 2003. Humble, A. M.: Technique triangulation for validation in directed content analysis. In: International Journal of Qualitative Methods 8(3) (pp. 34-51), 2009. Humble, A. M.: The second time ’round: Remarried couples’ gender construction in wedding planning. In: Journal of Divorce & Remarriage 50(4) (pp.260-281), 2009. Humble, A. M. / Zvonkovic, A. M. / Walker, A. J.: “The royal we”: Gender ideology, display, and asessment in wedding work. In: Journal of Family Issues 29 (1) (pp. 3-25), 2008. Hürten, Y.: Auswertung der Erprobungsmaßnahmen des Landes NRW “Neukonzeption der Migrationssozialarbeit” 2005/2006. Auswertung Fragebögen und Dokumentationen , Diözesencaritasverband Münster, 13. Juni 2006. Hürten, Y.: Dokumentation integriertes Feldprojekt “Projektbörse interkulturelle Arbeit”, Diözesancaritasverand Münster, Feldprojekt, 2006. Jensen, O.: Geschichte machen. Strukturmerkmale des intergenerationellen Sprechens über die NS-Vergangenheit in deutschen Familien. Edition Diskord, Tübingen, 2004. Karliczek, K.M. : Vom Nutzen qualitativer Forschung in der Kriminologie. Kriminologische Erkundungen. Wissenschaftliches Symposium aus Anlass des 65. Geburtstages von Klaus Sessar (pp.210-225), 2004. Kent, R.: Marketing Research : Approaches, Methods and Applications in Europe. Thomson Learning, London, 2007. Klein, M.L. / Deitersen-Wieber, A.: Prozesse der Geschlechter-differenzierung im Marketing-Management von Fitness-Studios. In: Hartmann-Tews, I. / Gieß-Stüber, P. / Klein, M.-L. et al. (Hrsg. ): Soziale Konstruktion von Geschlecht und Sport (pp. 187-222), Leske + Budrich, Opladen 2003. Koch, T.: Stille Post, Eine computergestützte qualitative Inhaltsanalyse „serieller Reproduktionen“ – Werkstattbericht – Torsten Koch – Universität Hannover – Institut für Soziologie und Sozialpsychologie – Fach Sozialpsychologie. Vortrag gehalten auf der Konferenz CAQD 2003 (Computerunterstützte Auswertung Qualitativer Daten), Marburg, 9.+ 10. Okt. 2003. Kommer, S. / Biermann, R.: Medien in den Biografien von Kindern und Jugendlichen. MERZ Heft 1/2005, 2005. Kommer, S. / Biermann, R.: Triangulation zur Annäherung an die Medienbiografie und die Mediennutzung von Jugendlichen. In: Buchen, S. / Helfferich, C. / Maier, M. S. (Hrsg. ): Gender methodologisch. Empirische Forschung in der Informationsgesellschaft vor neuen Herausforderungen? VS-Verlag, Wiesbaden, 2004. Kraft, S.: Kompetenzentwicklung von Lernmittlern in selbst organisierten Foren als neue Organisationsform. Deutsches Institut für Erwachsenenbildung, Bonn, 2003. Kuckartz, U.: Einführung in die computergestützte Analyse qualitativer Daten. VS Verlag, Wiesbaden, 3. Auflage, 2010. Kuckartz, U. / Ebert, T. / Rädiker, S. / Stefer, C.: Evaluation Online. Internetgestützte Befragung in der Praxis. VS Verlag, Wiesbaden, 1. Auflage, 2008. Kuckartz, U. / Dresing, T. / Rädiker, S. / Stefer, C.: Qualitative Evaluation: Der Einstieg in die Praxis. VS Verlag, Wiesbaden, 2. aktualisierte Auflage, 2008. Kuckartz, U. / Grunenberg, H. / Lauterbach, A.: Qualitative Datenanalyse: computergestützt. Methodische Hintergründe und Beispiele aus der Forschungspraxis. VS Verlag, Wiesbaden, 2. aktualisierte Auflage, 2007. Kuckartz, A.: Reply to Software Review of MAXQDA and MAXDictio. In: Qualitative Research Journal 4 (2), 2004. Kuckartz, A. / Kuckartz, U.: Qualitative Text Analysis with MAXQDA. In: Fundación de Estudios Andaluces (centrA): Documenta de Trabajo, Serie Sociología S2001 (06), 2001. Kuckartz, U.: Bulletin de Methodologie Sociologique. In: Ideal types or empirical types: The case of Max Webers empirical research by Kuckartz, Nr.31 (pp.44-53), 1991. Kyburz-Graber, R. / Hofer, K. / Wolfensberger, B.: Studies on a socio-ecological approach to environmental education: a contribution to a critical position in the education for sustainable development discourse. In: Environmental Education Research 12 (1) (pp.101-114), 2006. Kyburz-Graber, R. / Wolfensberger, B. / Hofer, K. et al. : Naturwissenschaften im sozialen Kontext. Eine Untersuchung zur Re-Orientierung des naturwissenschaftlichen Unterrichts an Gymnasien am Beispiel des Biologieunterrichts. Wissenschaftlicher Schlussbericht zum Nationalfondsprojekt Nr. 1114-065117.01. HLM, Universität Zürich, 2004. Kyburz-Graber, R. / Wolfensberger, B. / Hofer, K.: Developing critical thinking in environmental education. A video study of classroom discussions on socio-ecological issues in secondary schools. Paper presented at ESERA conference “Research and the Quality of Science Education”. Nordwijkerhout, The Netherlands, 2003. Langkau, T.: Gender Mainstreaming – blinder Fleck der Medienkonzeptarbeit an Gymnasien? In: Josting, P. / Hoppe, H. (Hrsg. ): Mädchen, Jungen und ihre Medienkompetenzen. Kopäd (pp.96-103), München , 2006. Lavender, T. / McFadden, C. / Baker, L.: Breastfeeding and Family Life. In: International Journal of Maternal and Child Nutrition (2) (pp.145-155), 2006. Lee, J. / Katras, M. J. / Bauer, J. W.: Children’s birthday celebrations from the lived experiences of low-income rural mothers. In: Journal of Family Issues 30 (pp.532-553), 2009. Leutner-Ramme, S.: Ausdrückliche Reflexionsanstöße und positive Schülerreaktionen – Intensivinterviews mit Lernenden zu aufgezeichnetem Geschichtsunterricht. In: v. Borries, B. / Fischer, C. / Leutner-Ramme, S. / Meyer-Hamme, J. (Hrsg. ): Schulbuchverständnis, Richtlinienbezug und Reflexionsprozesse im Geschichtsunterricht. Neuried, 2005. Leutner-Ramme, S.: Sonst wird man ja eigentlich nicht gefragt, sondern man muß einfach nur machen. Videogestützte Schülerbefragung zum Geschichtsunterricht. In: Schönemann, B. / Schreiber, W. (Hrsg. ): Zeitschrift für Geschichtsdidaktik, Jahresband 2003, Schwalbach / Taunus, 2003. Macfarlane, J.: The Relationship between Cultural Beliefs and Treatment-seeking Behaviour in Papua New Guinea: Implications for the Incorporation of Traditional Medicine into the Health System. Thesis for the Degree of Doctor of International Health of Curtin University of Technology, 2005. Mate-Toth, A.: Theologie in Ost(Mittel)Europa. Schwabenverlag, Ostfildern, 2002. Mewald, C.: A comparison of oral foreign language performance of learners in CLIL and mainstream classes at lower secondary level. In: Dalton-Puffer, C. / Smit , U. (eds. ): Empirical Perspectives on CLIL Classroom Discourse. Peter Lang, Frankfurt 2007. Mewald, C.: Englisch als Arbeitssprache auf der Sekundarstufe I: eine Analyse von Input und Output. In: Moderne Sprachen 48 (2), Wien 2005. Moser, H.: Instrumentenkoffer für die Praxisforschung. Verlag Pestalozzianum, Verlag Lambertus, Ettenheim, 2003. Nehring, D.: Modernidad con límites: La construcción narrativa de las relaciones íntimas, la sexualidad y el cambio social en la novela de autoayuda Juventud en Éxtasis de Carlos Cuauhtémoc Sánchez. Papeles de Población, 2006. Pastrana, T.: Körperlichkeit und Körperbilder schwangerer Frauen in Kolumbien: Eine kultursoziologische Analyse. Diplomarbeit, 2001. Rheingans-Heintze, A.: Lokale Akteursnetzwerke als lernende Organisationen. Analysen am Beispiel von „Lokale Abende21“- Prozessen. Ökonom Verlag, München 2003. Rosenberg, M. S. / Adams, D. C. / Gurevitch, J.: Meta Win: Statistical software for meta-analysis (Version 2.0). Sunderland, MA: Sinauer Associates, 2000. Sauer, A.: Europäische Naturschutzpolitik. Die Rolle der lokalen und regionalen Akteure bei der Umsetzung der FFH-Richtlinie in Deutschland. Oekom, München, 2007. Sarosa, S. / Lestari, J.: The Level and Impact of Web-based E-Government Adoption: The Case of Jogjakarta’s Local Governments. In: Reddick, C. (ed): Strategies for Local E-Government Adoption and Implementation. Comparative Studies, IGI Global Publishing, 2009. Sato, I.: Teisei Data Bunseki Nyomon (Introduction of qualitative data analysis). Tokyo, 2006. Scharf, M.: Projektunterricht – subjektiv betrachtet. Eine qualitative Studie mit Lehrenden für Deutsch als Fremdsprache. Schneider Verlag, Hohengehren, 2003. Schulze, B. / Angermeyer, M.C. : Subjective Experiences of Stigma. A focus group study of schizophrenic patients, their relatives and mental health professionals. In: Social Science and Medicine 56 (2) (pp.299 – 312), 2003. Schulze, B. / Angermeyer, M.C. : Perspektivenwechsel: Stigma aus der Sicht schizophren Erkrankter, ihrer Angehörigen und von Mitarbeitern in der psychiatrischen Versorgung. In: Neuropsychiatrie 16 (1-2) (pp.78-88), 2002. Siebenhüner, B. / Arnold, M. / Hoffmann, E. et al. : Organisationales Lernen und Nachhaltigkeit – Prozesse, Auswirkungen und Einflussfaktoren in sechs Unternehmensfallstudien. Metropolis, Marburg, 2006. Smit, A.A.H. / Driessen, P.P.J. / Glasbergen, P.: Conversion to Organic Dairy Production in the Netherlands: Opportunities and Constraints . In: Rural Sociology 74 (3) (pp. 383-411), 2009. Smit, A.A.H. / Driessen, P.P.J. / Glasbergen, P.: Constraints on the conversion to sustainable production: the case of the Dutch potato chain. Business Strategy and the Environment. Published Online in Wiley InterScience, 2006. Stumpf, M.: Erfolgskontrolle der Integrierten Kommunikation.Messung des Entwicklungsstandes integrierter Kommunikationsarbeit in Unternehmen. In: Bruhn, M. (Hrsg): Basler Schriften zum Marketing, Band 15, Gabler Verlag, Wiesbaden, 2005. Tabares, E. / Alvarado, B.: El niño en el Pacífico Colombiano. Perspectivas interdisciplinarias de la investigación en salud. Popayán, Universidad del Cauca, 2005. Tamasiunas, J.M.D. : Luces y sombras del desarrollo en una comunidad de desplazados por la Guerra. Universidad Pontificia de Salamanca, 2004. Tateo, L.: The Italian Extreme Right on-line network. An exploratory study using Social network analysis and content analysis integrated approach in the study of CMC and political groups. In: Journal of Computer-Mediated Communication 10 (5), 2005. Tateo, L.: Struttura delle relazioni e contenuto argomentativo dei messaggi nella comunicazione mediata da computer. FORM@RE – NEWSLETTER PER LA FORMAZIONE IN RETE, Erickson (27), 2004. Techmeier, I.: Die strafrechtliche Immunisierung in Wirtschaftsstrafsachen. In: Prittwitz, C. et al. (Hrsg.). Kriminalität der Mächtigen (pp.61-82). Baden-Baden: Nomos, 2008. Techmeier, I.: Korruptionsentstehung und Korruptionsbekämpfung aus der Unternehmensperspektive. In: Neue Kriminalpolitik 3 (pp.82-86), 2006. Van den Branden, S. / Broeckaert, B.: Medication and God at Interplay: End of Life Decision Making in Male Moroccan Migrants Living in Antwerp, Flanders, Belgium. In: Brockopp, J. / Eich, T. (eds. ): Muslim Medical Ethics: From Theory to Practice (pp. 194-208). South Carolina, University of South Carolina Press, 2008. Vogel, D.: What does Europe mean to Third Country students in the European Union? An explorative essay analysis. University of Oldenburg, POLITICS Working paper No.4/200, 2006. Wagner, B.: Arbeiten mit MAXQDA: Kurze Einführung in die computergestützte Analyse qualitativer Daten. Professur für Methoden der Empirischen Sozialforschung, Otto-Friedrich-Univ. Bamberg, Bamberg, 2003. Weber, M.: Heterogenität im Schulalltag. Leske + Budrich, Opladen, 2003. Wilfried, H.: Junge Menschen in stationärer Jugendhilfe. Eine Evaluations- und Nutzerstudie. Verlag Dr. Köster, Berlin, 2009. Wolfensberger, B. / Hofer, K. / Kyburz-Graber, R.: Schülerinnen und Schüler debattieren über Biotechnologien – Eine Fallanalyse von Klassengesprächen über ein Thema im Schnittbereich von Naturwissenschaften und Gesellschaft. In: Riess, W. / Apel, H. (Hrsg. ): Bildung für eine nachhaltige Entwicklung – aktuelle Forschungsfelder und –ansätze (pp.33-49),. VS Verlag für Sozialwissenschaften, Wiesbaden, 2006. Wolfensberger, B. / Kyburz-Graber, R.: Klassengespräche zu sozio-ökologischen Themen an der Schnittstelle zwischen Naturwissenschaften und Gesellschaft – eine Videostudie. In: Schrenk, M. / Holl-Giese, W. (Hrsg. ): Bildung für nachhaltige Entwicklung. Ergebnisse empirischer Untersuchungen (pp.113-129), Kovac, Hamburg, 2005. Wulfmeyer, M.: Bildung für Nachhaltige Entwicklung im globalen Kontext. Das Beispiel Namibia. IKO Verlag für Interkulturelle Kommunikation, Frankfurt a.M., 2006. Feuerstein, Th.J. : Computer Aided Case Management (CACM). Ein biographie- und netzwerkorientiertes Verfahren für die Qualitätsentwicklung in der arbeitsweltbezogenen Jugendsozialarbeit. In: Jugend Beruf Gesellschaft (S.95-100), 1999. Feuerstein, Th.J. : Ethnographisches Fremdverstehen in der beruflichen Bildung benachteiligter Jugendlicher. Ein computerunterstütztes Verfahren für die Praxis sozialpädagogisch orientierter Berufsvorbereitung und -ausbildung. In: Arbeitsgemeinschaft Berfusbildungsforschungsnetz / Euler, D. (Hrsg. ): Berufliches Lernen im Wandel – Konsequenzen für die Lernorte? Dokumentation des 3. Forums Berufsbildungsforschung 1997 an der Friedrich-Alexander-Universität Erlangen-Nürnberg (S.133-143), Nürnberg, 1998. Feuerstein, Th.J. : Biographie- und netzwerkorientiertes Case Management. Ein computerunterstütztes Verfahren für die Praxis der Sozialarbeit am Beispiel der beruflichen Bildung benachteiligter Jugendlicher. In: Neue Praxis (S.363-371), 1997. Kelle, U.: Integration qualitativer und quantitativer Methoden. Beitrag für die Tagung CAQD 1999.